Sony XZ3 configuration exposure: missed 48 million pixel IMX586? Not only that, there are digital bloggers broke the news, H8416, H9436 and H9493 codenamed "Akatsuki", equipped with Snapdragon 845 chip, 6/8GB RAM, 64GB/128GB ROM, 5.99-inch OLED display, the first 13 million after 19 million pixel CMOS. 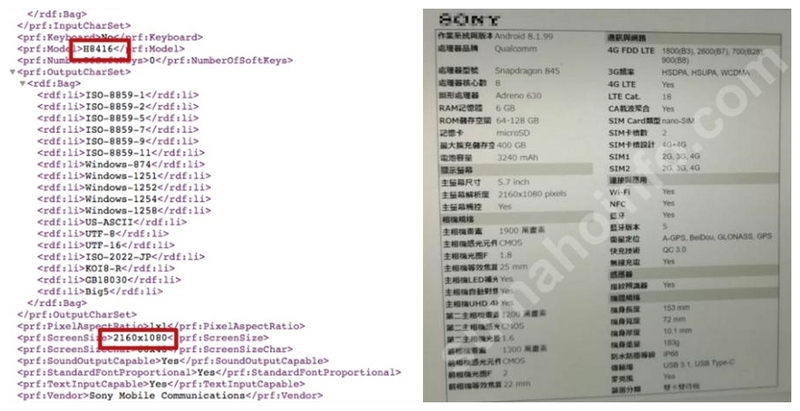 However, another specification sheet suspected of XZ3,processorAnd the camera information is right, the screen and battery can not prove each other. From the current XZ2 national bank once to kill 3799 yuan, the introduction of XZ3 should be no big suspense, but if it is really missed the Sony IMX586 of 48 million pixels, it is too regrettable. SONY XZ3 spy exposure: the shape is still the same. 5999 yuan? SONY Xperia XZ3 edition will be on sale soon.